The Robo Lego Geek Squad of Indian Lake Middle School took the grand champion prize at a Lego Robotics competition. All three ILMS Lego Robotics teams competed at Graham Schools. The team of Cameron Freyhof, Czar Dickson, Kailea Miller, Adeline Robinson, Annie Braig, Coach Jana Core, Meya Karbowiak, Amelia Schmiedebusch and Landen Wisener took overall first place. That means the Geek Squad qualified for regionals at Wright State University on Jan. 13 and 14. They are coached by ILMS teacher Jana Core and HTM engineer Joe Pietrykowski. In addition, The Robo Lego Rats team earned a Core Values Award, while their coach, Coach Marna Salmons, won the Awesome Coaching Award. 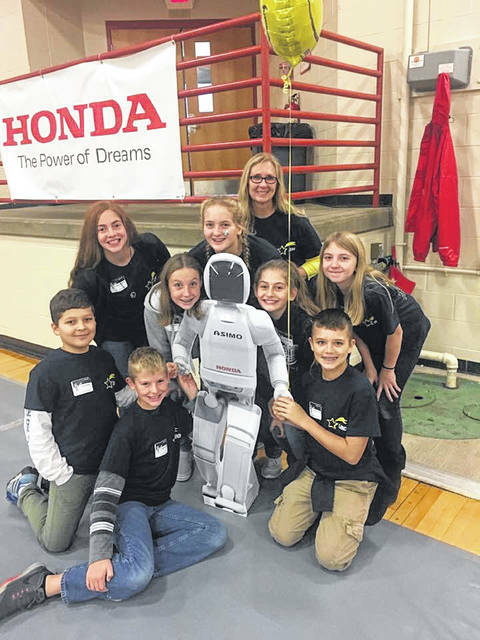 The ILMS Robotics teams are sponsored by a grant from Honda Transmission Manufacturing. From left are Cameron Freyhof, Czar Dickson, Kailea Miller, Adeline Robinson, Annie Braig, Coach Jana Core, Meya Karbowiak, Amelia Schmiedebusch and Landen Wisener.